21st century telephones, like other modern electronic products, have many of their features implemented digitally, using embedded computer software. New products can be produced by updating software and installing new microchips in existing hardware, changing only firmware. With new functionality implemented in firmware, new and changed digital products like music and video players, cell phones and cameras can be in stores very quickly. Sometimes that fast design and delivery cycle encourages manufacturers to refine their designs and produce higher quality products; but sometimes the headlong rush to the sales floor results in defective user interfaces, or just unreliable manufactured units. 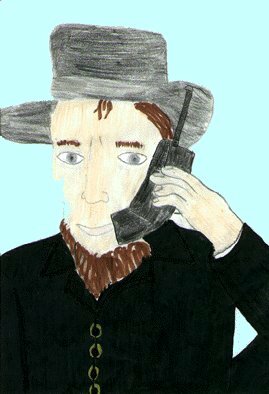 This story is about my encounter with two defective units of a digital telephone (whose user interface is actually quite good), and about how that experience reinforced my Amish approach to modern technology. I added a second home telephone line in the days when the only way to access the Internet was by phoning an Internet Service Provider (ISP). Having just a single telephone line made for impossible interrupted telephone conversations trying to chase down solutions to Internet connection problems, including long waits in telephone voice jails to reconnect after ISP agents' suggestions failed to solve problems. I kept the second telephone line even after switching to a higher speed Digital Subscriber Line which allowed simultaneous Internet access and voice conversations, because the installer told me that only the more recently installed second line was "clean enough" to carry DSL, and because my first line was reached by the phone number I'd used for years. To reduce the tangle of wires underneath the desk in my office, and to improve my on-the-phone productivity, I replaced my old telephone and supporting switches, wires and indicators with a modern two-line digital telephone. I found the replacement at a downtown Radio Shack (now called "The Source by Circuit City"). 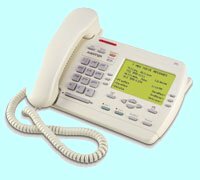 The Model 392 (no longer offered by Aastra, was based on the Model 390) has two lines, callerID, a large LCD display and some useful extra features (Hold, Redial, Digital Directory, ...) The spaghetti mess of cables under my desk was gone ... but my new phone didn't produce a dial tone. Pressing the keypad would sound touch tones, and the Options and Directory functions seemed to work, but there was no dial tone. The Line1 LED was always on, claiming that line was "off hook" (even with the handset in the cradle and all the other phone sets in the house unplugged). In addition, the LCD display showed "Line 1 Ext. in use". 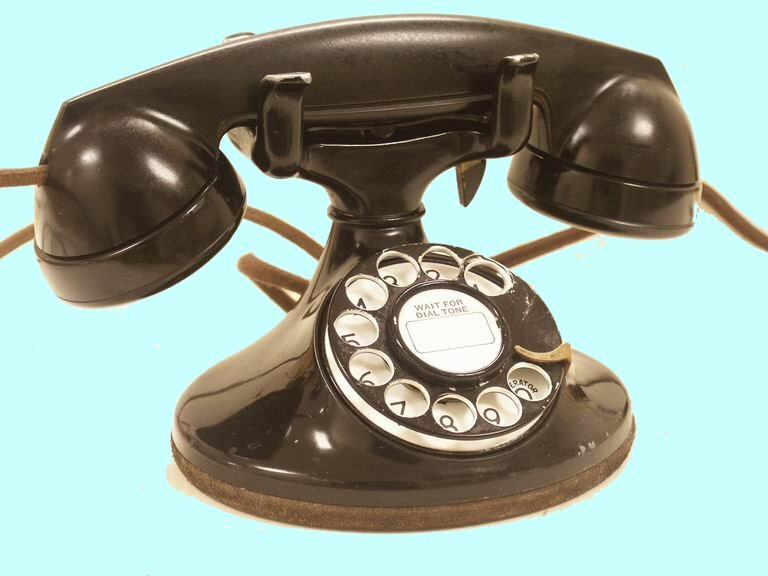 According manufacturer's reference guide, that message would appear not just when Line 1 was in use, but also when the telephone was the line was not properly connected. But the line was not being used, and the connection looked fine. Googling "Aastra phone" quickly led me to the corporate website where I found an 1-800 phone number and the email address "support@aastra.com". I emailed a polite, detailed problem report, and soon received an equally polite email reply from Vince, an Aastra product developer. He suggested that I "try several different telephone cords in different wall jacks". I'd already done that, so I called the 1-800 number and talked to Vince, who walked me through the (undocumented) steps to "reset" the Aastra 392's "flash memory". But that didn't solve the problem. Vince concluded that the unit was probably defective, and told me to take it back to the store and ask for a replacement. "Before you leave the store, make sure that you hear a dial tone and can make a phone call," he helpfully advised. Back at the store, the sales agent brought out a replacement telephone, and connected its two lines in turn to the store's single phone port. When the first line was connected, we heard a dial tone and we were able to place calls ... but not when the second line was connected. The agent claimed that the second line didn't work because the store had only a single phone number, and that the line would work when I got home. Like some intimidated newbie I blithely accepted his illogical claim! I took the new unit home and hooked it up to my own two phone ports, and ... it behaved exactly the same way it had in the store: Line 1 worked; Line 2 didn't. Vince responded to my next email with some more suggestions for problem isolation, including checking that I was using a proper 4-wire adapter cable (the simplest telephone sets can get by with a 2-wire cable, and amateur installers sometime use cheaper cables), which I was. To eliminate the possibility that my two failing units were part of a shipment of lemons, I bought my third Aastra 392 at another store. The salesman there was able produce dial tones and make calls on both Line 1 and Line 2. Taking that third unit home, I installed it the same way as I had the first two, and ... third time lucky: both lines worked! More than two years later, my Aastra Model 392 is still working, and I'm happy with it's performance. The sound quality is good; it has a large LCD display; the user interface is complete and intuitive (except of course for the misuse of the error message "Line 1 Ext. in use" to indicate an unsuccessful connection). So what went wrong with the original two defective units? Did they suffer an ordinary sort of manufacturing flaw. Or was there some latent programming error activated by cosmic rays! Don't laugh; that's not as outrageous as it sounds. A few months later the "Start" button on my electronically controlled Black and Decker toaster oven failed, rendering that product useless, apparently because the digital chips implementing its controls weren't insulated well enough from the oven's heat. Years ago this long diatribe would be just a (much shorter) complaint about defective telephone sets slipping through a manufacturer's quality control. But the defects in today's digital products are often hard to pinpoint, and even harder to understand. How many of you would have had the technical skills and obstinate dedication to recover from the defects that I encountered with my Aastra 392? Be honest: If you had encountered the double failure that I did, would you be now using your second two-line phone as a one-line telephone? Maybe you'd have given up after the first unit failed; some people I know wouldn't have even returned that first defective product to the store, but would have just stored it away in the basement. Problem determination using fault isolation is not something everyone practices as second nature. In my years of consulting to computer users beleaguered by computer misbehavior, I've often helped people who don't naturally isolate components to find faults. They are people of average or higher intelligence who have demonstrated competence in their other human activities. But many would no more think to perform fault isolation on a computer problem than they would think to pry the lids off their skulls and dig around inside for philosophical misconceptions. If you like, you can treat this story as just a nostalgic yearning for simpler times: when accountants did calculations using adding machines; when letters were written with pen and paper (quill pen and parchment? ); when experimenters used slide rules in physics labs; when "computers" were people who calculated the numbers to be listed in mathematical tables. But I hope you will consider it a cautionary tale, whose caution can be crudely stated as "Don't take any guff!". I suggest that you not be embarrassed to reject products that don't seem to work, to be shamed into accepting products so complex that you can't coherently describe their failures. Some new digital products are easy to use (such as most MP3 players), but others (like most programmable VCRs) have user interfaces that seemed to have been created by designers taking a break from their day jobs as creators of Sudoku puzzles. What about your telephone? Should you buy a sophisticated home answering machine, or instead subscribe to the phone company's "call answer" service? I find it convenient to hear my digital answering machine's synthesized voice announcement of callers' phone numbers. And I like being able to "screen" calls as they're being recorded (just as I could in the olden days). But when the power fails, my answering machine and my Aastra 392 telephone are useless, unlike the phone company's "call answer" service, which can be accessed from the simple telephones that use the low voltage power distributed along the telephone lines. When my digital answering machine eventually fails, I'll probably just switch to that simpler, more accessible, more reliable "call answer" service (and lose the ability to screen my calls). Do you remember the great North American power failure of 2003? I was around for the earlier blackout in 1965. With the lights out in the house, on the street, and even in the distant bank buildings, I went inside and called my mom: "Are the lights on where you are?" I could do that because in 1965 I wasn't using a digital telephone; my telephone set in those days was a simple terminal, drawing its power through the line that connected it to the phone company central office, which had backup batteries and power generators. During the almost continent-wide 1965 blackout anyone we could make calls for critical services like fire, ambulance and police. With a modern electronic telephone, during a power failure you will be unable to do that unless you have an uninterruptable power supply. And telephones using "Voice Over Internet Protocol" (VoIP), even the the latest, carrier-based VoIP services, are less reliable than POTS (the "Plain Old Telephone Service"). I call myself neo-Amish, because I (always? usually? occasionally?) decide whether to use new, potentially lifestyle-altering technology only after assessing the probable effects of that choice (which does not make me a neo-Luddite, who categorically rejects all technology). I don't own a car, because I live in the middle of a transit-friendly city; but I do occasionally use Auto-share for short term rentals. I rarely use a cell phone, and for outgoing messages only, because I occasionally like to luxuriate in peaceful isolation. And though I love my digital answering machine and my Aastra Model 392, I make sure I have quick access to at least one simple telephone set that will work even when there is a power failure.